A shocking 84 million adults in the United States are estimated to have prediabetes. Perhaps even more shocking is that a mere 12% of them have received the diagnosis.1 The other 70 million are unaware they have a disorder that places them at increased risk of developing type 2 diabetes, heart disease, stroke, and even some types of cancer. To increase awareness, the Centers for Disease Control and Prevention and other organizations are running a multimedia campaign. Dietitians can help people with prediabetes by sharing evidence-based recommendations tailored to their specific needs. A well-known and effective type 2 diabetes prevention strategy is weight loss. Both the federally funded Diabetes Prevention Program and the Finnish Diabetes Prevention Program showed that losing weight lowered the risk of developing type 2 diabetes among people at high risk. But not everyone with prediabetes needs to lose weight, and many individuals with extra weight or obesity don't want to focus on weight loss. Fortunately, there are additional lifestyle strategies to reduce the risk of type 2 diabetes and perhaps even reverse prediabetes. When the emphasis is on wholesome foods, an array of eating patterns may improve glycemia among people with prediabetes, explains Tami Ross, RD, LD, CDE, MLDE, a nationally recognized speaker, book author, and past president of the American Association of Diabetes Educators, who provides nutrition counseling and diabetes self-management education and support. Personalizing the diet plan while considering individual goals, health beliefs, culture, religion, economics, and metabolic goals is critical, she says. Below are three dietary patterns that show promise for managing or reversing prediabetes. A large meta-analysis of more than 100,000 participants from around the world found that those whose diets most resembled a Mediterranean style were 23% less likely to develop diabetes.2 The PREDIMED study found that after four years, those participants assigned to follow a Mediterranean-style eating pattern were 52% less likely to develop type 2 diabetes than those assigned to a low-fat diet. Though the specific foods eaten in countries surrounding the Mediterranean Sea vary by locale, this dietary pattern centers around fruits, vegetables, whole grains, olive oil, nuts, and other plant foods. In addition, clients will benefit from eating fish at least twice weekly. Wine is frequently consumed with a meal, and fruit is a typical dessert. Though the Dietary Approaches to Stop Hypertension (DASH) diet was created and studied to lower blood pressure, ongoing research finds it beneficial for those with prediabetes. 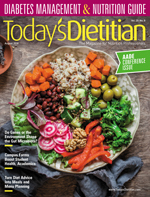 A meta-analysis of prospective cohort studies found that the DASH diet reduced the risk of developing type 2 diabetes by 20%.3 In the PREMIER study, individuals with high blood pressure who followed a DASH eating plan experienced improved fasting insulin and glucose levels as well as enhanced insulin action.4 Additional research shows that the DASH eating pattern improves dyslipidemia, lowers CVD risk, and is linked to lower risk of obesity.5 Though similar in many ways to a Mediterranean-style diet, the DASH eating plan is lower in fat and richer in animal foods, promoting consumption of fruits, vegetables, poultry, fish, nuts, whole grains, and nonfat and low-fat dairy products. • Legumes. Studies show that diets rich in beans, peas, and lentils have beneficial effects on both short-term and long-term fasting blood glucose levels.10 Possible mechanisms include their magnesium, phytonutrients, dietary fibers, and resistant starches, which resist digestion in the small intestine and are later fermented by bacteria in the colon. • Nuts. Though each type of nut has a unique nutrient profile, nuts are a source of unsaturated fats, magnesium, folate, fiber, and a host of phytonutrients. • Coffee and tea. The habitual consumption of either beverage is associated with decreased risks of developing type 2 diabetes. Mechanisms are unclear and may be related to the unique phytonutrients present in coffee and tea.13,14 Dietitians should advise clients to avoid common high-calorie add-ins such as whipped cream, heavy creamers, and syrups. Moreover, the ADA states that red meats and sugar-sweetened beverages are associated with a greater risk of the disorder.8 Overall, a balanced eating pattern with an emphasis on wholesome food choices rather than macronutrient distribution appears effective in decreasing the risk of developing type 2 diabetes. Even without weight loss, moving the body helps prevent type 2 diabetes. 1. Cardiovascular exercise. The ADA recommends people at risk of type 2 diabetes engage in at least 150 minutes of moderate-intensity physical activity, such as brisk walking, each week.8 Exercise improves insulin resistance for two to 48 hours, so clients should be encouraged to exercise as frequently as possible, even if they don't make time for the full 150 minutes each week. To help resistant or hesitant clients achieve the exercise goal, Nashville-based Lindsey Joe, RDN, LDN, a DPP Lifestyle Coach, encourages them to break it up into 10-minute sessions. "It's amazing where you can find pockets of time if you prioritize using them for activity and not scrolling on social media," she says. 2. Lift weights. "Resistance training is probably the most important exercise of all for anyone wanting to prevent type 2 diabetes," says Sheri Colberg, PhD, FACSM, a professor emerita at Old Dominion University in Norfolk, Virginia. "We store most of the carbohydrates we eat in our muscles." Resistance training builds more muscle, giving us more storage capacity for blood glucose, she says. 3. Reduce sedentary time. Even regular exercisers should avoid prolonged periods of sedentary behavior. The ADA recommends breaking up periods of inactivity with at least three minutes of walking, leg lifts, standing, or other light activity every 30 minutes. These activities stimulate the muscles to use blood sugar, Colberg says. When time is tight, many people skimp on sleep without knowing that shortened sleep or poor sleep can harm their health. In a meta-analysis of 482,502 participants, researchers observed a U-shaped dose-response relationship between sleep duration and risk of type 2 diabetes. The lowest risk of developing the disease was associated with a sleep duration of seven to eight hours per night.15 Research suggests that chronic and acute sleep deprivation impact glucose metabolism. For example, in a small study of healthy adults, one night of sleep restricted to four hours resulted in decreased insulin sensitivity of 19% to 25%.16 Dietitians can coach clients to set goals around bedtime and look for solutions to common obstacles of getting too little sleep. Though the majority of people with prediabetes will benefit from losing weight, it isn't the only successful strategy for diabetes prevention or delay. Even in the absence of weight loss, healthful eating, physical activity, and other lifestyle behaviors can improve health and prevent or delay the onset of type 2 diabetes. — Jill Weisenberger, MS, RDN, CDE, CHWC, FAND, is the author of the newly released book Prediabetes: A Complete Guide and the bestselling Diabetes Weight Loss — Week by Week. She's a freelance writer and a nutrition and diabetes consultant to the food industry, and she has a private practice in Newport News, Virginia. 2. Boucher JL. Mediterranean eating pattern. Diabetes Spectr. 2017;30(2):72-76. 3. Campbell AP. DASH eating plan: an eating pattern for diabetes management. Diabetes Spectr. 2017;30(2):76-81. 4. Ard JD, Grambow SC, Liu D, Slentz CA, Krauss WE, Svetkey LP. The effect of the PREMIER interventions on insulin sensitivity. Diabetes Care. 2004;27(2):340-347. 5. Jones N, Ray S, Monsivais P. The DASH diet, cardiovascular disease risk and obesity in the United Kingdom. FASEB. 2015;29(1 Suppl). 6. Tonstad S, Butler T, Yan R, Fraser GE. Type of vegetarian diet, body weight, and prevalence of type 2 diabetes. Diabetes Care. 2009;32(5):791-796. 7. Pawlak R. Vegetarian diets in the prevention and management of diabetes and its complications. Diabetes Spectr. 2017;30(2):82-88. 8. American Diabetes Association. 5. Prevention or delay of type 2 diabetes: standards of medical care in diabetes — 2018. Diabetes Care. 2018;41(Suppl 1):S51-S54. 9. Behall KM, Scholfield DJ, Hallfrisch J. Comparison of hormone and glucose responses of overweight women to barley and oats. J Am Coll Nutr. 2005;24(3):182-188. 10. Sievenpiper JL, Kendall CW, Esfahani A, et al. Effect of non-oil-seed pulses on glycaemic control: a systematic review and meta-analysis of randomized controlled experimental trials in people with and without diabetes. Diabetologia. 2009;52(8):1479-1495. 11. Mursu J, Virtanen JK, Tuomainen TP, Nurmi T, Voutilainen S. Intake of fruit, berries, and vegetables and risk of type 2 diabetes in Finnish men: the Kuopio Ischaemic Heart Disease Risk Factor Study. Am J Clin Nutr. 2014;99(2):328-333. 12. Chen M, Sun Q, Giovannucci E, et al. Dairy consumption and risk of type 2 diabetes: 3 cohorts of US adults and an updated meta-analysis. BMC Med. 2014;12:215. 13. van Dam RM, Hu FB. Coffee consumption and risk of type 2 diabetes: a systematic review. JAMA. 2005;294(1):97-104. 14. Yang WS, Wang WY, Fan WY, Deng Q, Wang X. Tea consumption and risk of type 2 diabetes: a dose-response meta-analysis of cohort studies. Br J Nutr. 2014;111(8):1329-1339. 15. Shan Z, Ma H, Xie M, et al. Sleep duration and risk of type 2 diabetes: a meta-analysis of prospective studies. Diabetes Care. 2015;38(3):529-537. 16. Donga E, van Dijk M, van Dijk JG, et al. A single night of partial sleep deprivation induces insulin resistance in multiple metabolic pathways in healthy subjects. J Clin Endocrinol Metab. 2010;95(6):2963-2968.